A grilled cheese sandwich couldn’t be easier to make. Heat a pan, butter some bread, add cheese in the middle, and voila–you’re in the business. A simple as that is, the devil’s in the details. The difference between a grilled cheese sandwich tasting like some melted cheese on bread and a heavenly treat is execution. The best method is low heat and slow cooking in a heavy pan, like aluminum core or pre-heated cast iron. This allows the proteins in the bread to crisp while the butter browns for optimal toasty, nutty flavor. For truly great grilled cheese, you also can’t skimp on the butter (or olive oil). Otherwise you’ll end up with brown spots instead of an even golden crust on the outside. In fact, if your meal plan allows for a lot of dietary fat, go ahead and butter and grill both sides of the bread. You’ll get double the crunch, plus a faster melt on your cheese. And if your fridge is only stocked with unsalted butter, be sure to sprinkle a pinch of salt over the buttered bread. Alright. 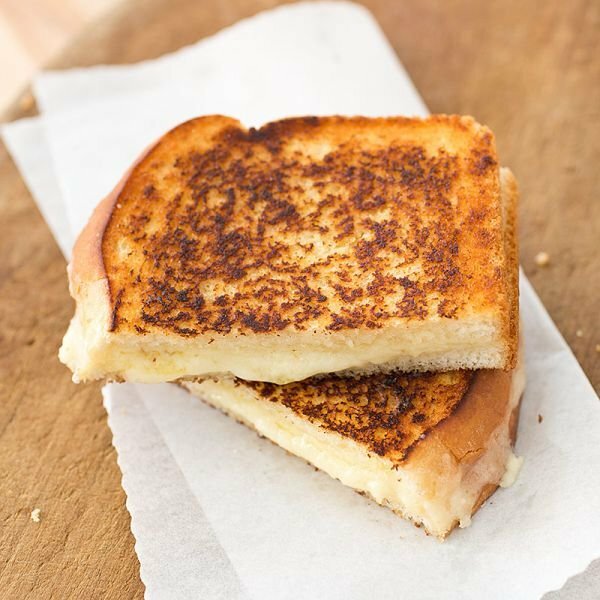 Are you ready to make some killer grilled cheese sandwiches? Let’s get to the recipes! 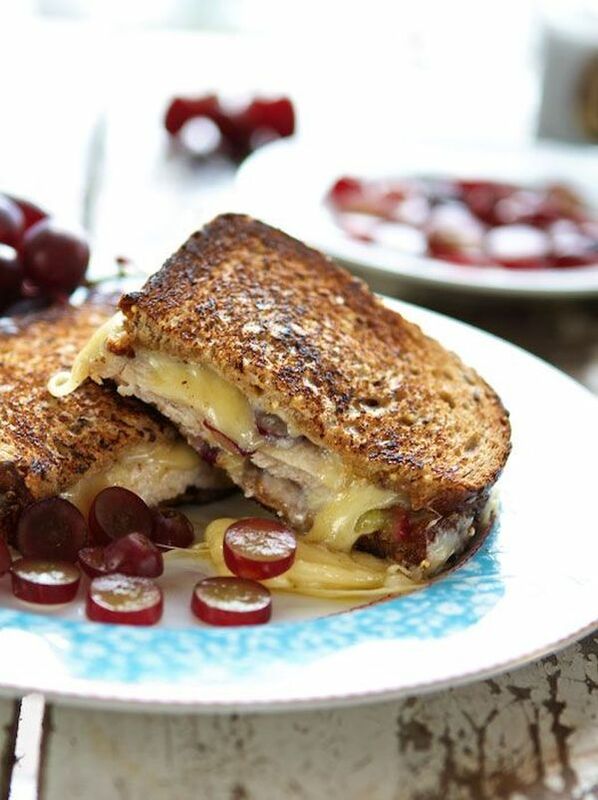 This recipe uses chicken and red grapes to put a twist on the classic grilled cheese sandwich found in picnic baskets everywhere. Cheddar cheese, cracked black pepper, and a touch of mayo complete the flavor profile. 1. Heat olive oil over medium-high heat in a small sauté pan. Season both sides of the chicken breast with garlic salt and pepper. Cook chicken breast about 5 minutes per side until cooked through. Set aside. 2. Butter the outside of the pieces of bread (the sides that will touch the pan). Smooth mayo over the inside of the bread slices. Top each piece of bread with slivered grapes and sliced cheese. Place chicken breast in the middle, and top with bread. 3. Cook until both sides are golden brown, crispy, and the cheese is melted. Flip once during cooking. If you’re trying to “go green” with your diet, this recipe is for you. It’s packed with micronutrients in avocado, kale, parsley, tarragon, chives, and spinach. As if that’s not enough, there’s a mix of goat cheese and mozzarella for the unmistakable tangy flavor of chevre but the standby melty texture of a grilled cheese. And to top all that off, you’ll have leftover pesto for topping pasta, pizza, and salads. 2. Very slowly drizzle in olive oil until kale and herbs get sufficiently chopped and everything is the consistency of a pesto. You may need more or less of the olive oil depending on how big a handful of herbs is to you. You can also turn off the food processor and push herbs down the side of the bowl with the spatula every once in a while. Season to taste with salt and pepper. 4. On one slice of bread, add a slice of cheese, sliced avocado, crumbled goat cheese, spinach, a second slice of cheese, and a second slice of bread. Press together gently. 5. Heat a tablespoon of olive oil in a frying pan over medium-low heat. Add the sandwich to the oil, and cook until the bread is golden brown. Press down on the sandwich lightly, and then flip it over to cook until the second side is also golden brown. 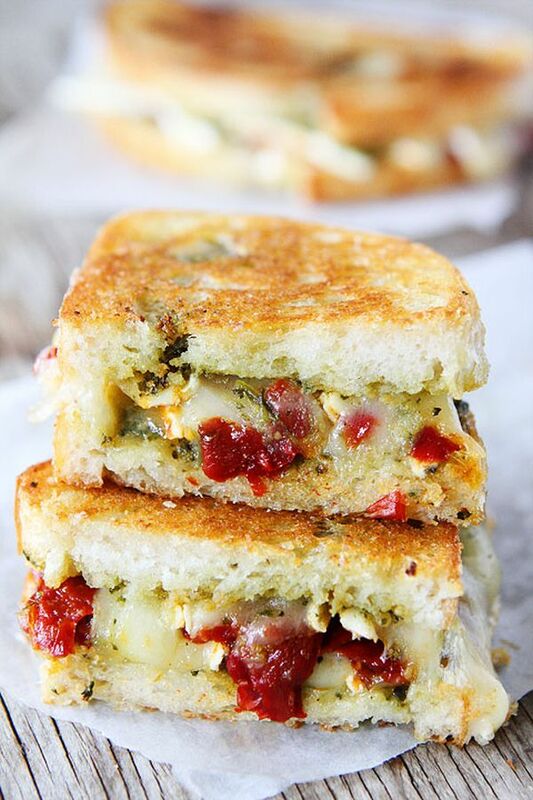 Round it out with whole-wheat bread, basil pesto, and roasted red peppers. You’ll at least be adding about 10 grams of protein from the bread, phytochemicals from basil to lower the stress hormone cortisol, and vitamins A, B6, and C from bell peppers. 1. Heat a skillet over medium heat. 2. Butter the outside of each slice of bread. 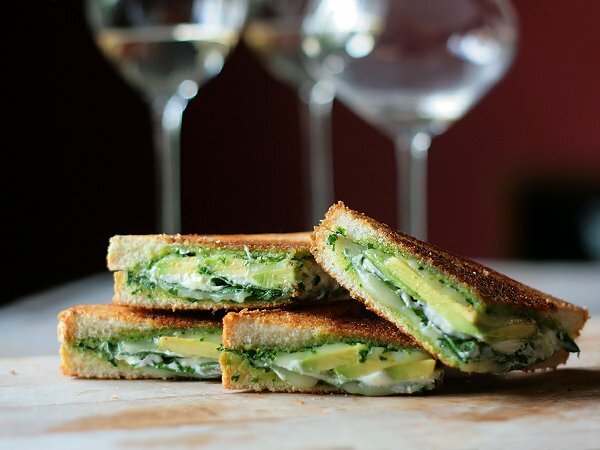 Spread basil pesto on the inside of each slice of bread. Place the peppers and brie slices on top of one piece of bread. Top with the other slice of bread. 3. Place the sandwich, butter side down, on the hot pan. Grill for 2–3 minutes, or until golden brown. Flip and cook until golden brown and the cheese has melted, about 2 more minutes. Serve immediately. Looking for a lighter grilled cheese? This one is light in all the right ways: crisp cucumber flavor, low-fat goat cheese, and hardly any ingredients in the shopping cart, and it’s a cinch to whip up. 1. Heat a cast iron skillet over high heat to get it very hot, and then reduce the flame all the way to low. 2. Using a pastry brush, lightly coat each side of each slice of bread. 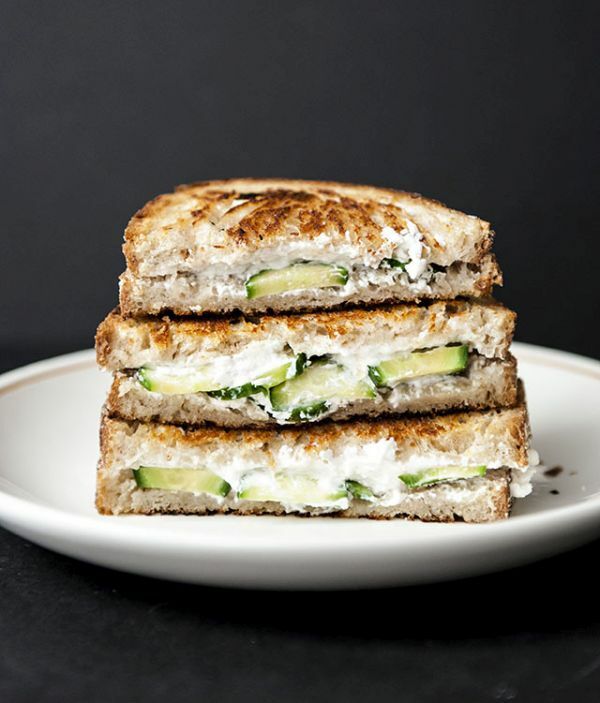 Spread a healthy layer of goat cheese on the bottom slice, and then arrange your cucumber slices on top. Carefully place the first half of your sandwich on the skillet, and sprinkle with salt and pepper. 3. Spread a thin layer of goat cheese on the next slice. Place this one on top of the first one, and let sit on the stove for about 5 minutes – make sure your heat is LOW. Use a spatula to lift the bottom slice. If the bread’s nice and golden, go ahead and flip the sandwich. Let that side sit for 4 or 5 minutes. When the second side is golden, remove from the pan. 4. Repeat for sandwich number two, and serve with remaining cucumber slices. This dish is a grilled cheese and autumn salad all in one. And it’s one heck of an upgrade from white bread and processed cheese – both in terms of flavor and nutrition. There’s sweet potato, red onion, kale, fresh rosemary, and balsamic glaze. And that’s not even the best part! All the components are married together with a buttery, creamy Havarti cheese. 1. Preheat the oven to 400°F. Place sweet potato rounds in a small bowl and drizzle with one tablespoon of the olive oil. Toss well. Season with salt and pepper, to taste. Place on a baking sheet and roast for 20-25 minutes or until tender. Remove from oven and set aside. Going without bread doesn’t mean you have to go without your favorite at-home sandwich. 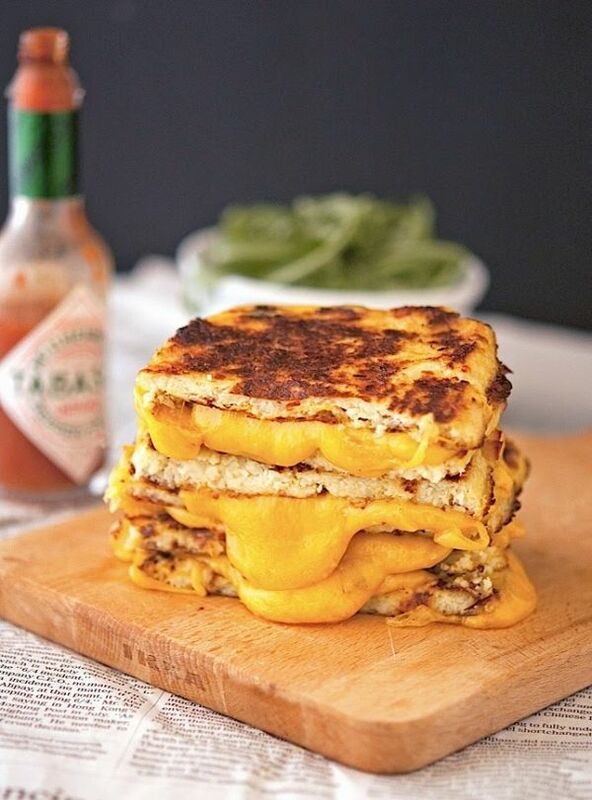 This classic is remade with cauliflower to make low-carb grilled cheese. It starts with riced cauliflower but ends up as a mozzarella crust, making the perfect healthy platform for melting your favorite cheese. Even if you aren’t eating a low-carb diet, this is a delicious grilled dinner that meets “clean eating” standards. 1 Tbsp. butter, room temp. 3 oz. shredded sharp cheddar cheese, room temp. 1. Preheat the oven to 450°F, and place a rack in the middle of the oven. Line a baking sheet with parchment paper, and liberally grease it with olive oil. Set aside. 2. In a food processor (or with a coarse cheese grater), rice the cauliflower florets. It should be evenly chopped but not completely pulverized. 3. Transfer cauliflower rice to a microwave-safe dish, and microwave on high for 8 minutes, until cooked. 4. Place the cauliflower rice in a tea towel, and twist it to squeeze as much moisture as possible (about a cup of liquid). This is very important. The cauliflower rice needs to be dry; otherwise you’ll end up with mushy dough. 5. Transfer the cauliflower rice to a mixing bowl. Add egg, mozzarella, salt, and pepper. Mix well. 6. Spread cauliflower mixture onto the lined baking sheet, and shape into 4 squares. Place in the oven to bake for about 16 minutes, until golden brown. 7. After being removed from the oven, let the cauliflower slices cool for 10 minutes before peeling them off the parchment paper. Be careful not to break them. 8. Heat a pan over medium heat. Butter one side of each slice of cauliflower crust (preferably the top part) to begin assembling grilled cheese. 9. Place one slice of bread in the pan, buttered side down. Sprinkle with the cheese, and top with remaining slice of cauliflower bread, buttered side up. Turn the heat down a notch, and cook until golden brown, about 2–4 minutes. Gently flip, and cook until golden brown on the other side, about 2–4 minutes. Not sure how you feel about using brie in your grilled cheese sandwiches? This recipe combines the best of both worlds – sharp cheddar and gooey, soft brie – for an adult version of grilled cheese. 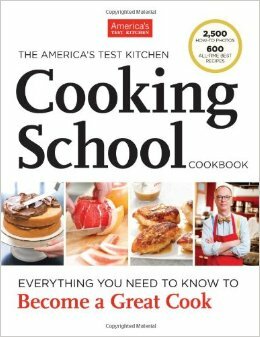 And if melting two cheeses together sounds advanced to you, it’s time to pick up America’s Test Kitchen Cooking School Cookbook, which gives you a thorough but easy-to-understand “crash course” in making delicious food. 1. Cut the cheddar into 24 equal pieces. Process cheddar, Brie, and wine in food processor until smooth paste is formed, 20 to 30 seconds. 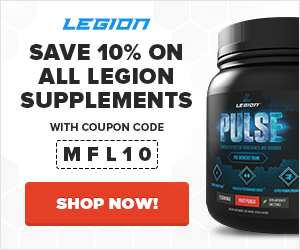 Add shallot and pulse to combine, 3 to 5 pulses. Combine butter and mustard in small bowl. 2. Working on parchment paper–lined counter, spread mustard butter evenly over 1 side of slices of bread. Flip 4 slices of bread over and spread cheese mixture evenly over slices. Top with remaining 4 slices of bread, buttered sides up. 3. Preheat 12-inch nonstick skillet over medium heat for 2 minutes. (Droplets of water should just sizzle when flicked onto pan.) Place 2 sandwiches in skillet; reduce heat to medium-low; and cook until both sides are crispy and golden brown, 6 to 9 minutes per side, moving sandwiches to ensure even browning. Remove sandwiches from skillet and let stand for 2 minutes before serving. Repeat with remaining 2 sandwiches. 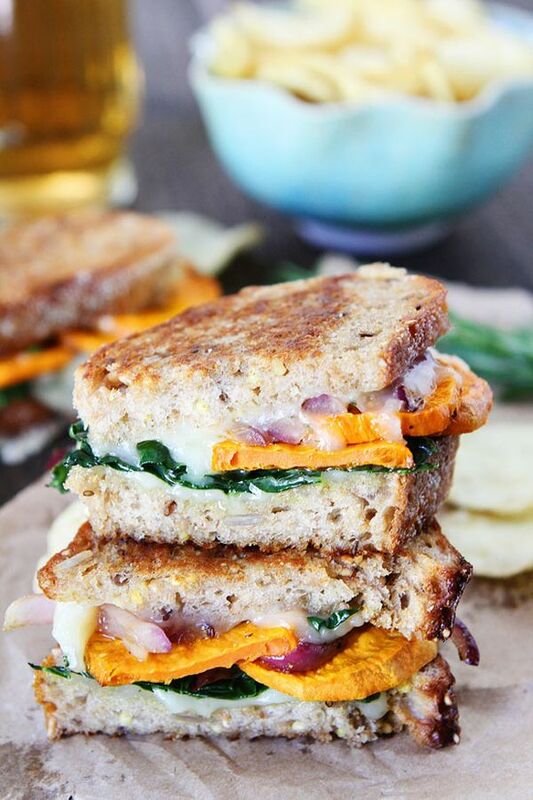 What did you think of these healthy grilled cheese recipes? Have anything else to share? Let me know in the comments below!